As the first edition of my address book is presented to the public, the opening day has been made into a regular guide, which is still going to be of benefit to both the city's own inhabitants and visitors. Faced with the subscribers, I have to pray for forbearance, when the publication due to the circumstances of the Lord has been greatly delayed, as at the time of the first passage, it is bound up with a great deal of difficulty in getting the material collected and arranged, which, however, will be much easier, as later, there will be many errors and shortcomings in this edition of the edition of the edition, which will be avoided in later editions. In connection with this, you allow me to state that this time I have kept myself far within the urban boundary, whereas in the next edition the colony at the parade, the euro and the lower seekers as well as the Aasveien will also be included. To all those who have kindly assisted me with information for this edition, my heartfelt thanks are hereby given, and at the same time I allow all those who either miss their addresses or who by their names find false reports of goodwill to Notify me of this. Such information, as well as announcements by business people and traders, who may be of interest and who are enrolled in the next issue, are kindly submitted to Hilmar Moe, Munkegaden 44. Tariffs for hauliers who have the police permission to keep with horses and vehicles on the town square, public spaces and streets for the promotion of persons in the city and its immediate vicinity. 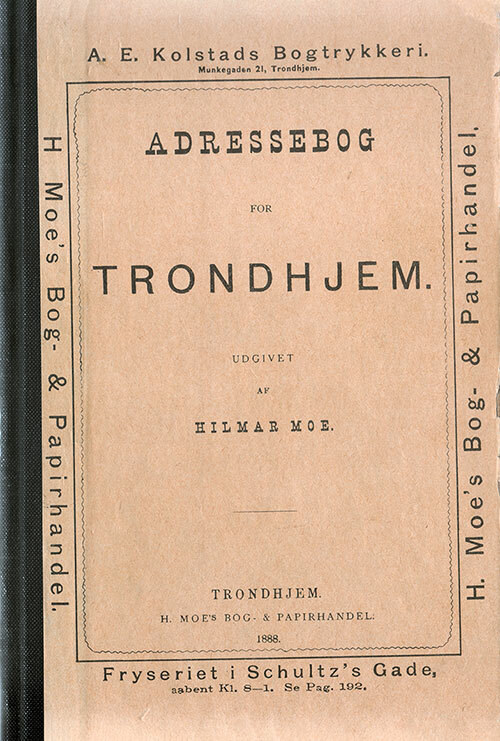 Hilmar Moe, Adressebog for Trondhjem, © 1888, H. Moe's Bog- & Papirhandel, Trondhjem, Norge, Hardcover, 150 Pages.